Grown, prepared and frozen within the UK. Suitable for vegetarians. Be Inspired Our Chips are made from our famous red Rooster potatoes. Simply oven-cook them to enjoy a crispy skin and a deliciously light and fluffy middle. 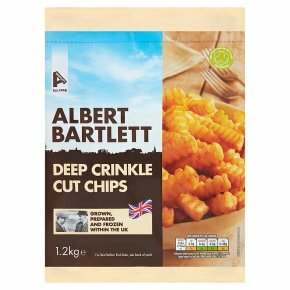 Tip Cheats Aioli: Try mixing mayonnaise with garlic purée to taste and serve it as a dip with your Albert Barlett Deep Crinkle Cut Chips. Once defrosted do not re-freeze.All appliances vary, the following is a guideline.Take care - product will be hot.Remove all packaging. Spread the Chips evenly on a baking tray with upturned edges and place in the top of an oven preheated to 230ºC / Fan 210°C / Gas Mark 8 and cook for 15-18 minutes until crisp and golden.Turn the Chips at least once during cooking to ensure an even crispness.Ensure the Chips are piping hot before serving.Not suitable for microwave cooking.